The MB-150 was a French low-wing, all-metal monoplane fighter aircraft with retractable landing gear and closed cockpit developed by Société des Avions Marcel Bloch as a contender in the 1934 French air ministry competition for a new fighter design. Although the competition was won by the prototype Morane-Saulnier M.S.406, development proceeded culminating in the first attempted flight of the MB.150.01 prototype in 1936. Unfortunately, the plane proved unable to leave the ground! This was not good. With modifications consisting of a strengthened wing of greater area, revised landing gear, and installation of a 940 hp (701 kW) Gnome-Rhone 14N-0 radial engine with a three-blade constant speed propeller, the MB.150 finally flew in October of 1937. Handed over to the Centre d'Essais du Materiel Aerien (CEMA) for service trials, its performance proved sufficiently interesting to warrant further development. This brought, at the very beginning of 1938, a small increase in wing span and installation of a 14N-7 engine. When trials were completed in the late spring of 1938, SNCASO was awarded an order for a pre-production batch of 25 of these aircraft. No such production of the MB-150.01 ever occurred, the plane being totally unsuitable to mass production. Redesign would lead to the MB.151.01 and MB.152.01 prototypes, developed and produced in parallel. By the outbreak of World War II, some 120 had reached the Armée de l'Air, but few of them were flyable, most missing their gun sights and propellers. The MB.153 and MB.154 were intended as test beds for American engines, but only the former flew, and when it crashed a few days later, damaged beyond repair, pursuit of these alternatives also ceased. Instead, attention shifted to extending the range of the MB.152. This was achieved by moving the cockpit aft in order to make room for a new fuel tank. Other modifications included a slightly broader wing and revised aerodynamics around the cowling. The result, designated MB.155 performed favorably in flight tests and was ordered into production in 1940, however only 10 aircraft had been completed by the fall of France. Under the terms of the armistice, the remaining 19 on the production line were completed and delivered into Vichy service. From there, some eventually made their way into the Luftwaffe after 1942. The final member of the family, the MB.157 utilized a far more powerful engine and eventually became a very different aircraft as the design evolved from the MB.152 to accommodate the larger and heavier power plant. Unfinished at the time of the armistice, it was ordered to be completed and flown under German supervision. Demonstrating superb performance, it was taken to Orly where the power plant was removed for testing within a wind tunnel. The excellence in the design was confirmed. It was later destroyed in an allied air raid. MB.151s and MB.152s equipped six fighter Groupes during the Battle of France, but proved completely outclassed by the Messerschmitt Bf 109E. They continued to fly in the Vichy air force until this was disbanded. Some of these aircraft were then supplied to Romania, which flew them against the Russians. Nine MB.151s were exported to Greece. They flew against the Italian and Germans scoring several air-to-air victories. If you have built any of the MPM family of 1/32 scale kits over the last few years, you know that while these are technically still short run kits, they are very nice short run kits that offer some very interesting subjects. This one is no exception. The molding is very good with no sink areas, only a teeny bit of flash and with only the large pieces having ejector towers. Once cut off they will be hidden from view when the kit is done. 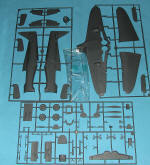 There are three major plastic sprues and one for the clear bits. The wing and fuselage sprue are nice a shiny smooth, while the one with all the smaller pieces is definitely quite matte in appearance. This should enhance paint sticking to it. Clear pieces are well done and quite clear without a hint of stress fractures, often a problem with short run kits. The resin is quite extensive covering the engine (separate cylinders and all), prop hub and spinner, seat cowling and cowling face, exhaust, oleo scissors and some interior bits. 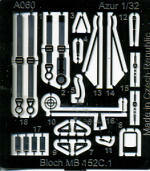 The photo etch is used mostly for the seat harness, gun sight and some small external bits. Interestingly, the rudder and elevators are separate, while the ailerons are not. There are no separate flaps. The only option shown in the instructions is one of attaching an external rudder tab actuator. 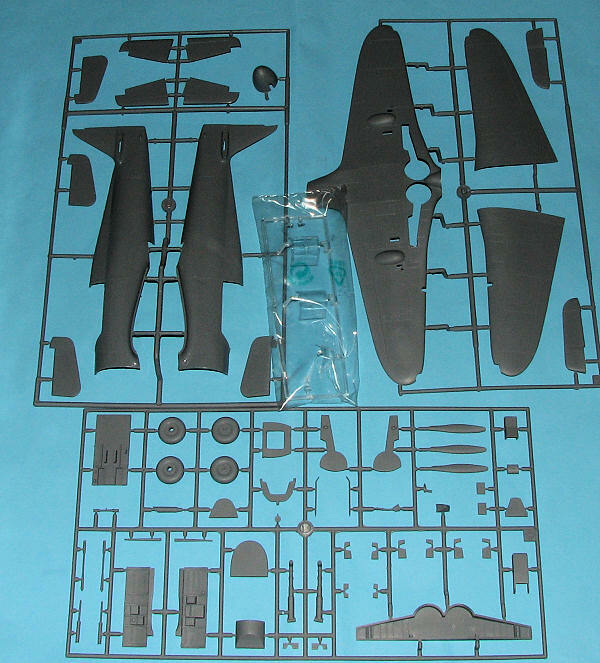 This is not a complex kit, and perhaps Azur is pandering to the increased age of its customers, because the instructions are quite large and well illustrated. Gunze paint references are used as well as generic names throughout. As there are undoubtedly additional boxings to be done, the painting and decal sections are separate and in full color in their own, smaller, booklet. Three options are provided, all aircraft being in the same, standard camouflage scheme of the time. First is the box art plane, white 8, from GC II/6. It as well as the others are from the June 1940 time period. Next is white 48, from GC II/9, while the third is white 7 from GC I/8. 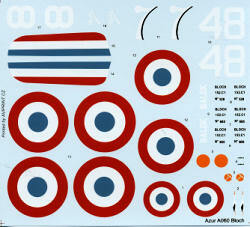 The decals themselves are superbly printed by AviPrint and should be both thin and opaque. Nice to see this one being released. French WWII planes are not always given the 'plastic space' of other types and it is up to folks like Azur/MPM to provide these for us. If it is anything like the D.520, it will be a great model once it is built.